When you’re worried that something may be going wrong with your water supply, the last thing you need is to be taken to the cleansers over cleaner water. That’s why we are happy to offer homeowners a free consultation! Our goal isn’t to simply sell you a product, but to truly diagnose any potential problems, and to provide sustainable solutions for your home. Our expert consultants are able to identify not only the quality of your water, but where the problem is being introduced, from source to faucet. For any problem that arises, you will be offered a custom solution that suits your family’s needs, budget, and maintenance schedule. Let’s face it, not everyone has time to babysit their water! Let’s take a tour of our services so you know what to expect from your consultation! In our first example, our customer told us that she already had a water softener, but the flavor of her water was off-putting. Some of her drains and faucets were releasing a foul odor, even after cleaning, and she was considering a Reverse Osmosis System for her home. Our consultant arrived with visual aids and a list of questions to help our client identify the issue. Even clear-looking water can be problematic. This means that much of the time, looking at your water won’t tell you anything about what’s wrong with it. 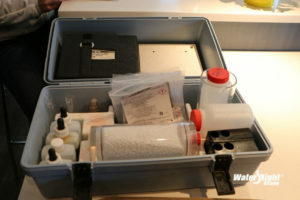 That’s why your Water Right dealer will arrive equipped with a kit of testing gear. Together, you will learn about where your water comes from, and what it has been exposed to on its way to your home. Once your testing is complete, your representative will take a tour of your water supple, from your basement to your garage. Many times, investigating your plumbing system will uncover interesting facts about what your water is going through. Literally. In this scenario, our client already had a water softener, and it needed to be examined as well, to ensure its proper function. 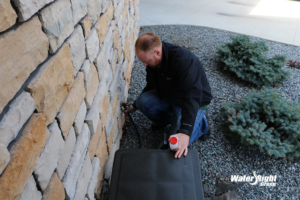 We needed a sample of this home’s unsoftened water, which meant using an outdoor source. This home had municipal water, which means it was treated by the city or community in which the client lived. That doesn’t necessarily mean the water was of good quality. Learning which compounds the water contains is imperative to deciding what exactly needs to be done about it. What Can You Tell by a Smell? Water is absolutely sensational, so it stands to reason that we need to use all of our senses to fully experience it. When the taste is off, the feel is gritty or slimy, we can see impurities, why wouldn’t we employ our sense of smell? In this case, our representative could only smell the chlorine the municipality employed to clean the water. In other cases, we may smell Sulphur, or a rotten egg odor. Our homeowner only noticed the smell in the laundry room and bathroom, and only sometimes. Our rep suspected that the problem could be with the drain itself. 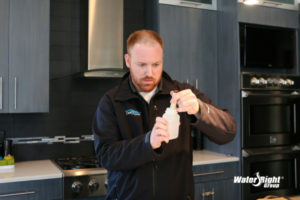 This home already utilized a water softener, and so many test did not need to be performed. We did test the home’s TDS, or percentage of Total Dissolved Solids. 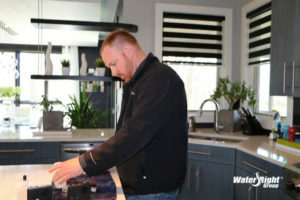 We discussed each test with the homeowner as we performed them, explaining what we were looking for and what the results of each test would mean. We also tested for Manganese, Iron, nitrate, and sulfur. A sample of the home’s water was sent to a special testing facility to detect any additional issues that may be present in the supply. If you have specific concerns about serious issues like lead, arsenic, or other contaminants, samples can be sent to our state certified Clean Water Testing lab. From there, you will receive a comprehensive water evaluation. Testing the hardness of water means examining the percentage of the water that contains dissolved solids. 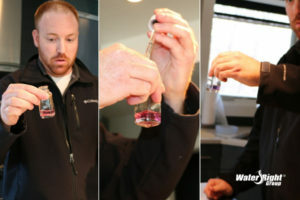 A cocktail of solutions will react to your water based on the level of dissolved solids present. It may look like a makeshift science kit, but it’s a simple procedure that adds nothing to your supply and only tests what is already present. The water coming from this home’s outdoor, untreated supply testes as quite hard, but the water coming from the kitchen faucet tested as soft. This told us that the existing softening system in place was doing its job just fine! Most people who are familiar with hard water assume that calcium and magnesium are the only dissolved solids that contribute to hard water conditions. 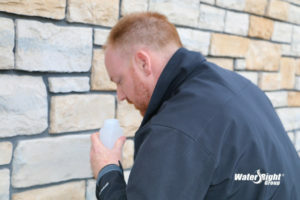 Water Right tests much more extensively than that to get a very clear picture of your home’s Total Dissolved Solids, or TDS. This can be comprised of any organic matter dissolved in your supply, often accumulated as water passes through its natural environment of stone, iron, and all other organic matter on its way to and from your municipality. 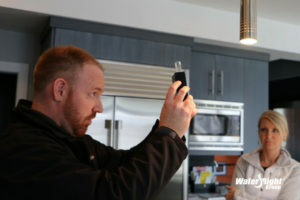 Our homeowner had been exclusively drinking bottled water to avoid the taste, smell, and mouth-feel of her home’s water. Once we tested her home’s TDS, we weren’t surprised she was opting for a bottled source. You home’s water is absolutely crucial, and yet surprisingly vulnerable to minor changes. The PH level of your home’s water is a snap shot of how alkaline or acidic the supply is. The PH scale is a 14 point scale, the higher end being alkaline and the lower end being acidity. 7 would indicate neutral water. Acidic water can corrode appliances and fixtures very quickly. Having water that’s too acidic can cause your plumbing to corrode at an accelerated rate. The fact that the homeowner was unhappy with the taste of her home’s water meant that it was time for a proper cleaning. Anyone who drinks the proper amount of water can also tell you where they enjoy drinking their water from the most. The water from your own faucet should be your favorite, and our mission was to get this home’s water up to the homeowner’s standards. Not everyone enjoys the taste of soft water, and the chlorine added by her community’s treatment facility and the TDS in her supply added up to unfavorable flavor. It was time for this customer to experience what a Reverse Osmosis water purification system could do for her home. RO systems filter out even the most microscopic of additives and impurities, leaving you with the cleanest, most pure drinking water available. 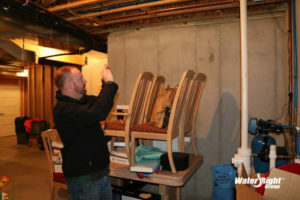 The system can be installed under the sink, or if space is an issue, in the basement. Once all of the results of testing have returned, so will we, to explain all of our findings and suggestions. We provide not only what we discovered, but pamphlets and information to offer all of the implications and possible solutions. We aren’t happy until we know we can make our clients happy. If you are satisfied with knowing that your water is safe, then we are perfectly happy! If you are interested in solutions to make your water cleaner, remove harsh odors, or improve the flavor, then we can provide customized solutions for that as well! No Such Thing as a Free Lunch, But a Free Consultation? Now that we can do! We were able to provide a solution to this client to save her plumbing, and to save her from a lifetime of buying bottled drinking water. Now that you understand our process, let us do the same for you! 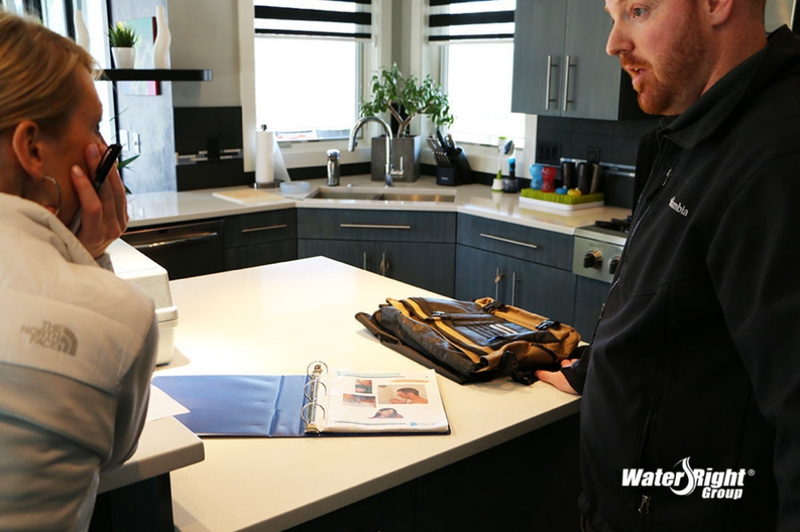 Make an appointment for a free in-home consultation and let’s find out what’s going on with your water supply! From hello to goodbye, this appointment will take about an hour of your time.